This is generally amusing given the topic of my course (“Adolescents’ Digital Media Uses, Skills and Participation”), but it’s additionally funny since I was just adding an article to the syllabus that appeared in the journal The Information Society. How Do I Get Popular on YouTube Without Talent? wow, does it really need to be this compilcated?! I haven’t posted one of these in a while. (Although this was on my latest links list, I’ll give it a separate entry.) The twist: this one has a worthy cause attached to it. Test your vocabulary skills and donate rice at the same time. It’s interesting to note which countries have already fulfilled their pledge in international aid to address world hunger, and which countries haven’t taken any concrete steps. Can you guess? (Time) – according to the State of NJ: No. 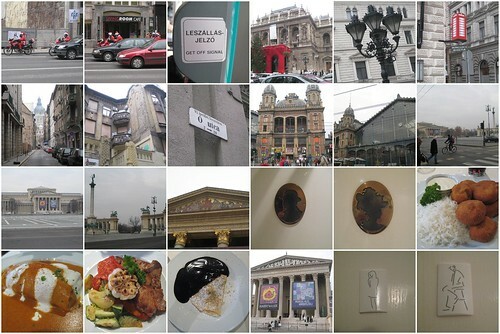 I didn’t get a chance to blog about my trip to Budapest a month ago. I had a really great time and took lots of photos so if curious then click through to my Flickr set on it for some beautiful architecture and some great food. The links below are just a small sampling and not necessarily of the best shots since it would’ve been too much work to customize the mosaic in that way. Little app for Windows that allows you to move the taskbar and tray icons around – awesome! I’ve been hoping for something like this for a long time. You are currently browsing the Eszter’s Blog weblog archives for January, 2008.